Father Kevin Schmittgens, president at St. Francis Borgia Regional High School, greeted visitors from Catholic schools April 24. 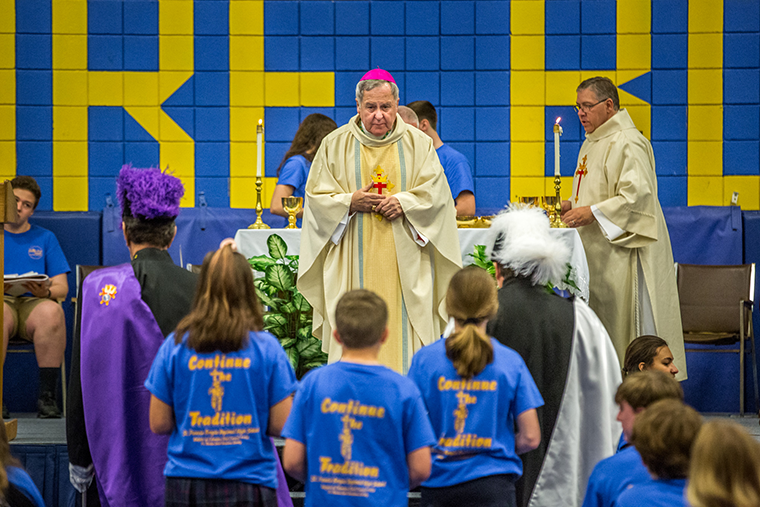 Archbishop Robert J. Carlson celebrated Mass at the high school, which invited students from area Catholic grade schools. For about five minutes on April 24, The Ray DeGreeff Gymnasium at St. Francis Borgia Regional High School sounded like, well, a gymnasium. 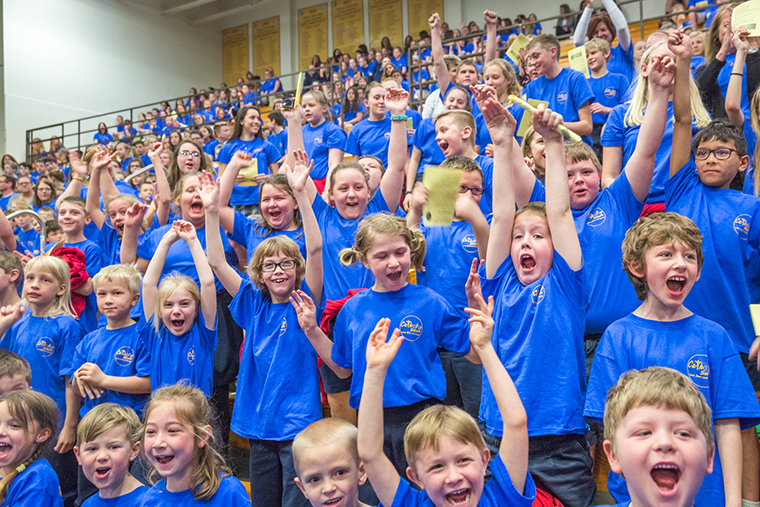 Similar to a sporting event, raucous cheering filled the gym as school president Father Kevin Schmittgens welcomed the region’s elementary Catholic schools, whose students had taken up residence in the bleachers and floor seating. They whooped, hollered and otherwise celebrated at hearing their school’s names. Children cheered as they were recognized before Mass with Archbishop Robert J. Carlson at St. Francis Borgia Regional High School in Washington. The Mass was attended by the high school students and also students from local parish schools. After recognizing the schools, Father Schmittgens uttered the magic word – prayer. “We have to settle down a little, OK, as we enter into our time of prayer,” he said, then leaving the temporary altar stage and walking up the main aisle. Almost instantaneously, quiet descended upon the crowd. The students — about 1,700 in all, including 570 Borgia students — transitioned to reverent silence, which was interrupted only by the hum of the overhead HVAC. Moments later, Borgia junior Gracie Huels announced what already was obvious. “The gym has now been transformed into the house of the Lord,” she said. It remained thus for the next hour with Archbishop Robert J. Carlson celebrating a “very special Mass,” as Father Schmittgens called it. In addition to Father Schmittgens, pastors of the parish schools concelebrated, with assistance from Deacons Jim Carter and Stephen Young — also, the principal of St. Gertrude in Krakow. After Mass, St. Francis Borgia received its annual check — for $130,000 — from the Annual Catholic Appeal, the primary reason for the gathering. But rather than limit the Mass to just the Borgia community, the high school invited 11 partner schools in the Washington Deanery — schools united by Catholic education. Afterwards, Father Schmittgens called the Mass “a wonderful event” and marveled at how the students transformed the gym into sacred space. Visiting students overwhelmingly gave the Mass the thumbs up. St. Gertrude sixth grader Andrew Young described the Mass as “cool” and enjoyed “seeing all of those kids in one place,” an assessment shared by classmate Justin Mort and St. Gertrude seventh graders Celia Gildehaus and Avery Marquart. Archbishop Robert J. Carlson celebrated Mass at St. Francis Borgia Regional High School in Washington on April 24. The Mass was attended by the high school students and grade school students from Catholic schools in the region. Marquart, who also found the Mass “really inspirational,” attended Borgia’s previous Mass for regional schools about 10 years ago. Borgia senior Emily Reuwer missed that one; she was in public school at the time, but this one made up for it. According to Moira Vossbrink, the high school’s marketing and admissions director, the region’s principals determined “it was time” to have another regional Mass. Vossbrink organized the event, but she had plenty of help. Along with Father Schmittgens and Vossbrink, Borgia student ambassadors welcomed busloads of students to the high school, but didn’t stop there. The ambassadors ushered them to the gym, sat with them during Mass, then saw them off after. Borgia students also set up and broke down, converting the gym to and from sacred space. Video production students live-streamed the event on YouTube. The choir nailed the hymns. All in all, the Mass “turned out really well,” he said.